A fellow beer geek, blogger, and brewer, Alan, dropped by my place yesterday. Alan is at Niagara College in the Brewmaster’s program and is on reading week. He had a bit of time in the midst of taxiing his sons around Southern Ontario and wanted to share a special drink with me that he had been saving. 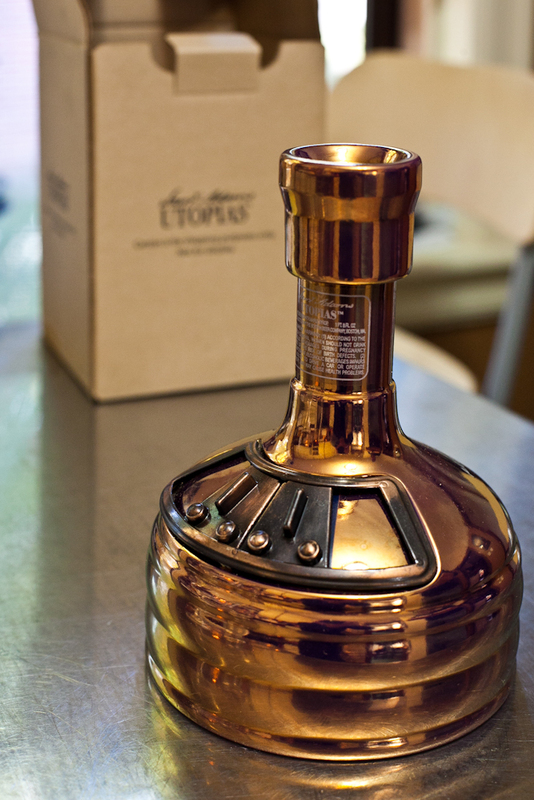 Sam Adams’ Utopias is one of the specialty beers coming out of the Samuel Adams brewery in Boston. It’s less like beer and more like a liqueur. It sort of changes one’s perception of what beer can be. In Ontario the beer was released by the LCBO in a lottery format. With so few bottles being produced by the brewery and such demand for the product the LCBO decided to buy a very limited number of bottles and offer them to customers in a lottery format. Put your name in to request a bottle and if they draw your name you can buy one. They aren’t cheap either! The packaging of the beer is stunning. 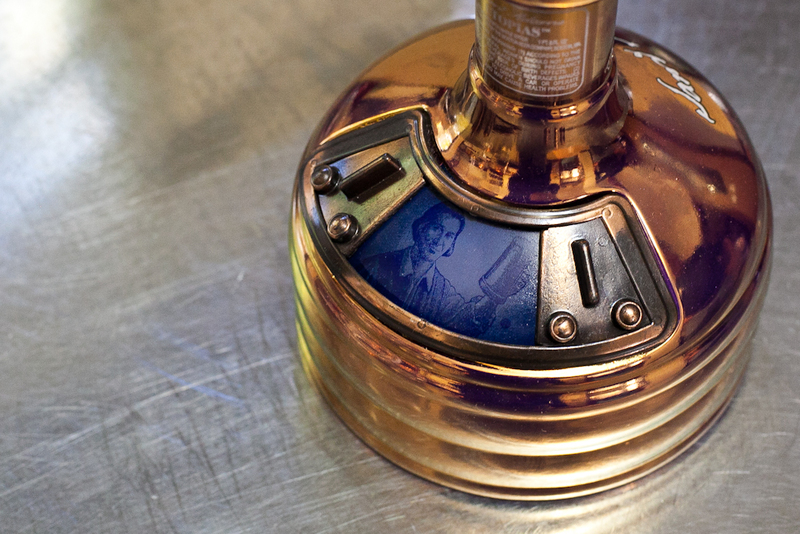 It’s a miniature replica of a copper boil kettle used in breweries with little sliding doors to reveal a smiling portrait of Samuel Adams himself. I don’t do beer reviews per se but I will say that this was a thoroughly enjoyable beer. It pours flat with no carbonation. Our pours were a little hazy but they were the bottom of the bottle and I have no idea what the initial pours were like, whether they were clear or also hazy from the get go. 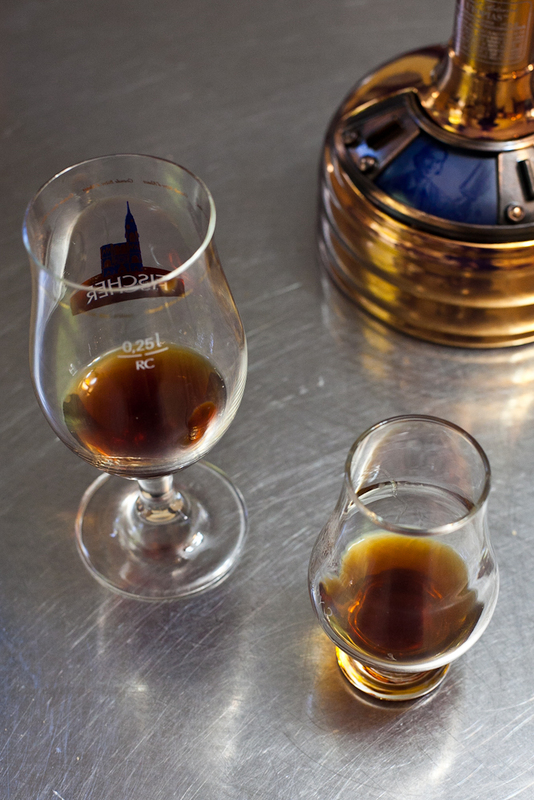 Lots of interesting smells in the aroma of the beer and that all carried through to the taste. Such a complex beer which, as I said earlier, challenges and changes ones perception of what beer is or can be. Many thanks to Alan for dropping by with this special treat! It was a thoroughly enjoyable visit and a pleasant way to spend a beautiful fall afternoon. This entry was posted on Tuesday, October 23rd, 2012 at 8:49 am	and tagged with ale, beer, bottles, brewing, Commercial, meet up, photography, sam adams, samuel adams, sipper, utopias and posted in beer, breweries, photography, reviews. You can follow any responses to this entry through the RSS 2.0 feed. Indeed! A total surprise, was not expecting it at all yesterday.